What do Circe, Mussolini and the Big Top have to do with Ponza? You ask these questions infrequently only because you're not sure what Ponza is. Or even worse—when you saw the word 'Ponza' maybe you thought of the character of that name in Pirandello's play Così è (se vi pare) [Right You Are if you Think You Are]. If so, you are very well-educated and should probably be reading something else. #1. What in the world am I talking about? —An island near Naples, something like Capri, but without the tourists. 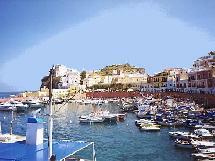 Ponza is 50 miles NW of the island of Ischia and is the largest (10 sq. km) of the Pontine islands. The others in that archipelago are Palmarola, Zannone, Gavi, Ventotene and Santo Stefano. The islands are in the Italian region of Lazio, and Ponza is just over 20 miles/32 km from the closest point on the mainland, Mount Circeo. The island is, in fact, part of the Circeo National park. #2. Why is it called Ponza? —They used to say that the name derived from Pontius Pilate, whose family owned a grotto on the island. That, clearly, is the best story. Kill-joy revisionist etymologists point out, however, that Strabo's Geography (which predates the birth of Pilate) does mention an island of "Pontia", so it may be that if you're a big fan of the man who judged Jesus, you will just have to grin and bear the downgrade. #3. What is one really cool mythological thing about Ponza? —The island is said to be the island of Aeaea in Homer's Odyssey. (This was so long ago that the Greeks had not yet invented consonants.) Anyway, it was the island of Circe, the sorceress who cast a spell on Odysseus (Ulysses) and turned his men into swine. #4. After Ulysses, who has been the most famous prisoner held on Ponza? —Benito Mussolini. The Italian dictator was overthrown in July of 1943. He was arrested and shuffled from place to place in order to keep the Germans from finding and rescuing him. He was eventually moved to Campo Imperatore high in the Gran Sasso Massif (Italy's "Little Tibet"), where the Germans found and rescued him. (They did this in a bizarre and daring glider raid. If the Allies had pulled that off, there would have long since been a movie about it. Maybe John Wayne in Down for the Duce!) Before Gran Sasso, however, Mussolini was held on Ponza. The New York Times from October 1, 1943, reports that il Duce was on the island for 10 days until September 7, during which time "he did everything he could to win the favor of the people. He made little speeches to those who gathered around [and] gave 1,000 lire to the parish church for masses to be said for his son, Bruno, who was killed in an air accident two years ago." American writer John Steinbeck reported (NYT, Sept. 13, 1943) that "I talked with a number of inhabitants of Ponza [and] they said Mussolini assured them he would return to power in Italy and reestablish the Fascist regime, comparing himself with Napoleon—the parallel being to Napoleon's 100 days exile on Elba." #5. Is there anything particularly strange about that episode, maybe even more unbelievable than Circe turning Ulysses' crew into little piggies? #6. Is there any weird sociology? —Linguistically, perhaps. The same issue of the NYT (above) reported that "Brooklynese, not Italian, is the dominant tongue. Many of the 8,000 residents made moderate fortunes in the United States and went back to Ponza to retire. Among themselves they always spoke Brooklyn [sic], and now almost everybody on the island speaks it, too." #7. What is this stuff about the Big Top? —In civilian life, Lt. Henry Ringling North, USN, was the vice-president of the famous Ringling Bros. and Barnum & Bailey Circus—the Big Top, the "Greatest Show on Earth." In WWII he was the leader of the small unit that landed and "took" Ponza on Sept. 13, 1943. It didn't need much taking. The first person to greet North was Frank Feola, who had worked in the United States for the Baltimore and Ohio railway for 30 years. #8. Is Ponza still a neat place? —Yes. Tourists have discovered it, obviously, but it's not that bad. There are now about a dozen hotels on Ponza and I guess they wouldn't be there if they didn't do good business at least during the summer months. But a bit into the off-season, things tail off quickly. It's not even that easy to get there from Naples; you have to drive an hour up to Formia for a boat because they stop running from Naples in mid-September. The scenery is spectacular. There is a botanical garden and you can always visit the Grotto of Circe and the Grotto of Ulysses. (They now live in separate grottoes, but I don't know whose idea that was. Circe has another place nearby on the mainland in that national park named for her. See question #1, above.) Hiking, swimming, scuba diving and sailing are great. The permanent population is around 3,300. That is down considerably from the 8,000 cited (above) from the 1940s. If the figures are even close to accurate, the decline is due to emigration between 1950 and 1970 when many of those who lived from fishing (at the time, the main livelihood on the island) left Ponza for other waters in the Italian Mediterranean, such as Elba and Sardinia. #9. Do they still say of a winter's night when "the wind is a torrent of darkness among the gusty trees, and the moon is a ghostly galleon tossed upon cloudy seas" that you can catch Circe turning tourists into pigs? —No, but if you crack any puns about the island being a "Ponza scheme," even I cannot protect you.